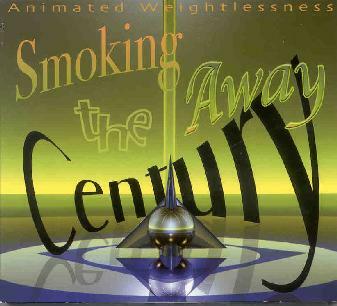 Smoking the Century Away - "Animated Weightlessness"
Multi-instrumentalists Jorge Beltran and Victor Basurto, collectively known as Smoking the Century Away, perform some of the most daring, adventurous, and creative music I've heard in a long time. From it's strange, vaguely art-deco cover design, that hearkens back to some past yet futuristic era, to music that would be difficult to place in any era, this is an album that could change the way you listen to music. Hailing from Mexico (Basurto is originally from Holland - how many albums can you name that were recorded in both Mexico and The Netherlands? ), the duo, who also record under the name Humus, and as part of the band Frolic Froth, explore an avant-garde sound that at first seems very electronic, till you listen closer and hear acoustic guitar, bass, and percussion woven so subtly and cleverly into the mix that you realize it's part of what gives this music such a unique sound. Defying convention by opening their album with their 20-minute long sonic epic Even More Glueland (rather than closing the album with the epic, as most bands do), STCA jumps right into their pulsing, mind-bending journey with a truly bizarre but mesmerizing masterpiece. Though rhythms and structure do emerge throughout the piece, this is definitely not conventional music in any sense of the word. Yet despite its rampant avant-gardism, it's a surprisingly pleasant listen. Beltran and Basurto lovingly craft each of their vast array of sonic oddities with a rounded edge, making the music both highly challenging, yet intriguingly accessible. The rest of the album consists of shorter, but no less interesting pieces, from the dark and percussive Denizen to the mysterious and moody Smoked Palm. A standout is the shrieking and clattering soundscape of Alice of Glazer, with its haunting voice samples and plunking, jazzy piano conjuring visions of dark alleys in forgotten parts of the city. If you're up to the challenge, give this album a try. It may just take you to places you've never been before, and places you scarcely even imagined existed! The Frolic Froth web page has a little info on Smoking the Century Away: http://www.euronet.nl/users/gnomon/frolic_froth_home.html.